The battery has run flat in your car and you’re waiting on someone to come fix it. You can’t park in your favoured space at work and now have to walk twice the distance as usual, from your car to the office. Your train is running late. The coffee machine has broken and you can’t get your regular latte from your favoured café on the commute into work. 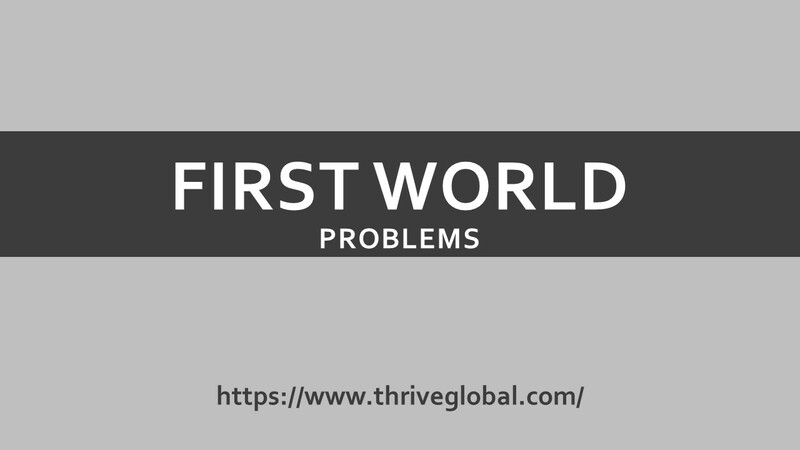 What do all of the above ‘problems’ have in common, they are first world problems. The simple truth is, if you have a roof over your head, your freedom, are in a safe environment with no threat of impending violence to your person and know where your next meal is coming from, you’re pretty damn lucky. People not fortunate enough to be in this place might consider none of the opening examples to be problems at all. It’s all a matter of perspective. There are so many people in the world worse off than we are. Some people that endure unimaginable hardships on a daily basis, just trying to live their lives. We have a responsibility to them all to not waste, and overlook, the precious gifts we already have in our lives. To complain about ‘how tough we have it’ just because we had a difficult day, does a disservice to these people. Somewhere along the way, many of us have lost sight of gratitude in our lives. We’ve spent so much time chasing more, chasing our goals, trying to keep up with our neighbours, trying to get that promotion that we have forgotten to embrace gratitude in our lives. What if we focused less on what we don’t have and instead were thankful for all we do have. What if we made time to notice the small everyday wonders all around us. Wouldn’t this lead to a deeper state of gratitude and general happiness with the way things are? Wouldn’t this highlight the fact that if first world problems are all we have to worry about, life is not too bad after all? Finding something to be grateful for can transform our outlook. It can alter our perspective and help us see all we already have. All we have already achieved. All we already are. We can make a little time, each and every day, to reflect on something in our life we are grateful for. This doesn’t have to be time consuming and it doesn’t have to be complicated. We can ponder on one thing or come up with a handful. Many ways can work. It might make sense to start at one thing we are grateful for, to ingrain the habit of reflection, before moving to more. Our list can include large and small things we are grateful for. What we’ll realise is that the things we often consider small (a walk in the park, a cup of coffee with a loved one) are actually the big things. They can add so much to our feelings of wellbeing. Before you complain too loudly about your day, pause for a moment and reflect how lucky you are if what you’re complaining about can be considered a first world problem. Maybe, in the grand scheme of things, it’s not really a problem at all.